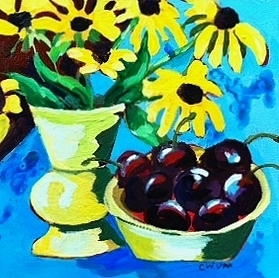 ‘Black-eyed Susans and cherries’ by Claudia Van Nes of Chester. CHESTER — During May, Maple and Main is devoting its Stone Gallery to a new type of exhibit for the gallery: each unique painting in the show will be 8”x 8” in dimension and sell for $200. The 60 or so paintings were created especially for this show by Maple and Main artists in a wide selection of styles and medium. 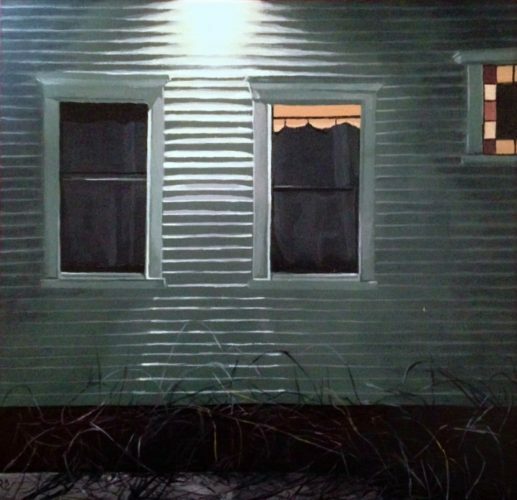 An opening party for the Small Gems: 8”x8” show will be Friday, May 5, from 5 to 8 p.m. which is First Friday in Chester as well as the town’s annual May Daze Stroll. The gallery will serve wine and Mexican dips in a nod to Cinco de Mayo which is also May 5. All other galleries, shops and restaurants in Chester will also be open offering food, drink and special events. The Small Gems show runs from May 6 through May 31. Maple and Main, at One Maple Street, is open Wednesday and Thursday from noon to 6 p.m., Friday, noon to 7 p.m.; Saturday, 11 a.m. to 7 p.m. and Sunday, 11 a.m. to 6 p.m. Contact the gallery at Mapleandmaingallery.com, 860-526-6065 or on Facebook and Instagram.